The one-year ban period of Steve Smith and David Warner is set to end on 29 March 2019. With the duo pretty much in the plans for the World Cup 2019, their reintegration into the squad was important. Therefore, both of them were given an opportunity to spend a day with the Australian team that is currently in the UAE preparing for the series against Pakistan. While it was anticipated the Smith and Warner would be included in the Australian side straightaway for the last two ODIs against Pakistan, it wasn't to be the case. The cricketers chose to make a come back through the Indian Premier League (IPL) instead. The duo was earlier banned due to the Sandpapergate incident last year in South Africa. Apparently, Steve Smith and David Warner flew to the UAE to attend a number of meetings with the players and the coaching staff. 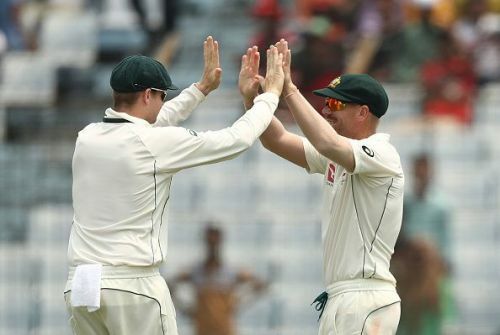 “It’s been great, it seems like there’s really good energy around the group at the moment coming off the back of what was a terrific win in India,” Smith said. Both Steve Smith and David Warner will play the IPL 2019 for their respective franchises. While Warner has already arrived in India, Smith is expected to be here soon. They will have to prove their form and fitness in the upcoming league.